The XRP-series is designed specifically for deployment in ''mission critical'' applications that require fast and efficient disc burning and printing, rock-solid reliability, and professional-quality recorded and printed CDs, DVDs and Blu-ray (BD) Discs. Primera's end-to-end architecture includes all the components you need for the most integrated and reliable systems possible: advanced hardware and software, matched supplies, and perhaps most important, local on-site installation, training and service by factory-certified technicians. Applications already implementing Primera's XR-series systems include medical imaging, banking and insurance, government, military, kiosks, live video and audio processing, digital photo processing, and content-on-demand at retail stores. All XRP-series hardware is built with tough, 18-gauge steel cabinets and 11-gauge steel bezels. Access doors are supplied with locks and keys for maximum security. Supplies replenishment is accomplished entirely from the front, allowing placement virtually anywhere: on counters, shelves and even in standard 19'' wide racks with optional rack mount kits. Disc Publisher XRP can be used as a stand-alone production system or combined with a Server-XR. Disc Publisher XRP is a fully automated production system which burns and prints up to 100 discs at a time. The included 4800 dpi Hi-Speed inkjet printer with special dye-based inks provides stunning results. Disc Publisher XRP comes with a full software package which includes PTPublisher CD/DVD recording software for Windows OS and Discribe from CharisMac for Mac OS X v10.2. With the 1-2-3 Easy Step installation and a single USB 2.0 connection the Disc Publisher XRP is up and running in a few minutes. Included with every XRP-Series Disc Publisher is burning software for Windows PT Pulisher, Mac software from CharisMac, and disc printing software from SureThing. PTPublisher NE Network Software is a new software package for Primera's Disc Publisher that adds network capability for your disc burning and printing jobs. Primera's PTPublisher NE software allows you to share your Disc Publisher XR or Disc Publisher XRP over a network. An unlimited number of client licenses are included, saving you time and money when you need to add new users. 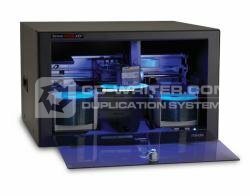 It's the ideal solution whether you are publishing ''one-off'', unique content discs or duplicating quantities of discs from a master disc or files stored on a PC's hard drive. The PTDevSuite Software Developer's Kit (SDK) allows developers to quickly and easily integrate any of Primera's industry-leading CD/DVD publishing systems. This comprehensive API for Windows XP/2000 provides full control of all burning, direct-to-disc printing and robotics functions. Almost one thousand developers around the world are using PTDevSuite in a wide range of applications such as music and video content on-demand, medical imaging, backup and archival, legal and court reporting, document imaging, banking and insurance, digital photo processing and much more. PTDevSuite is available at no charge to registered developers. * Water and smear resistance. Leveraging a proprietary surface that utilizes nanoparticle technology to grip and hold ink, printed images are locked in place exactly where originally applied. The discs are highly resistant to smearing and color bleed when exposed to water and humidity. * Better color reproduction and sharper images. With its pure white surface, TuffCoat with AquaGuard or WaterShield provides the contrast and illumination needed for better color reproduction, more accurate color matching and more brilliant images than the print surfaces on other inkjet printable discs. * Faster and more cost-effective. Other methods of protecting a recordable CD or DVD against water, such as lamination and expensive reverse thermal transfer printers, are no longer required. This allows businesses and consumers of all types to use much lower cost disc printers and duplication equipment. Production is faster since no additional steps are required to receive professional-quality, robust and highly water-resistant results. Whether you're duplicating audio, video, data, software, photos or any other digital information, make a positive, lasting impression with Primera's new TuffCoat with WaterShield Surface and TuffCoat with AquaGuard Surface Media. Both provide an extremely high level of water- and smudge-resistance with no lamination required. Primera is a member of the Blu-ray Disc Association and is the world's first manufacturer of automated disc publishers to announce support for Blu-ray Disc technology. Disc . Publisher . 4102 . XRP . 2x . DVD .